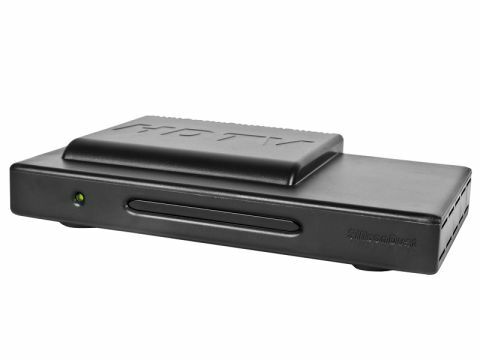 The HDHomeRun is essentially a dual DVB-T tuner box with built-in networking capability. Connect it to an aerial and your home network and you can route Freeview pictures from each independent tuner to any PC on your network. If your PC is in a room that doesn't have an aerial outlet, it's ideal. Using additional 'HomePlugs' you could even network using your mains circuits rather than a wired LAN system. The HDHomeRun is a rather unimpressive plastic unit with LED indicators on the front, and on the back an Ethernet port, two aerial sockets, and connector for the external power supply. You get two RF leads, an Ethernet cable, and a CD containing Windows XP/Vista, Mac OSX and Linux driver software. But no manual. The two-page installation instructions are on the SiliconDust website, and after that you're pretty much on your own. To install it you connect the two tuners to an antenna or cable signal, using a splitter if necessary to feed any other set-top box, then connect the HDHomeRun to your home network or PC. Software installation takes only a few seconds. When you run the management software it presents a small menu requesting your country and postcode, then identifies the two tuners and prompts you to select an application for each: Beyond TV, GB-PVR, Sage TV, TotalMedia, Windows MediaCenter or MediaPortal. None of these is included, so it's up to you whether you want to use them. You also need to create a desktop shortcut for the HDHomeRun software, as it doesn't do it for you. Scanning for channels fills the Antenna Channels list; we got tuning information and channel names, but not guide numbers. Click on a View button for your desired channel and – nothing happens. You first have to download and install the freeware viewing program VLC. Considering the quality of daytime Freeview broadcasts, the final results were perfectly viewable, whether connected directly to the PC or via the network. The HDHomeRun Configuration application displays information about channel numbers, signal strength and data rates, and accesses system upgrades. You can run multiple tuners as a 'pool' shared between several PCs using Windows Media Center, GBPVR, MediaPortal, or TotalMedia software, with tuners automatically allocated to PCs as required. In spite of the HD tag, HDHomeRun won't support any HD broadcasting in the UK. Perhaps a version equipped with the necessary DVB-T2 tuners will follow in time. Nor does it have an internal hard drive to record to. We'd rather it had just been called HomeRun. As mentioned, no recording software is supplied, belying the package's claim that the box itself will 'pause and record digital TV'. It's assumed that you will have some media package supporting Windows Home Server, such as Sage TV's Media Center. In the US, HDHomeRun is popular with users building 'tuner farms' bigger than a PC could possibly accommodate. In the UK it seems more likely that the main application would be for simple network distribution – a rather expensive solution to a problem you might solve using multiple tuner cards. There's much discussion of HDHomeRun on the forums at www.silicondust.com, so perhaps that would be a good place to start to find out whether it would appeal to you.